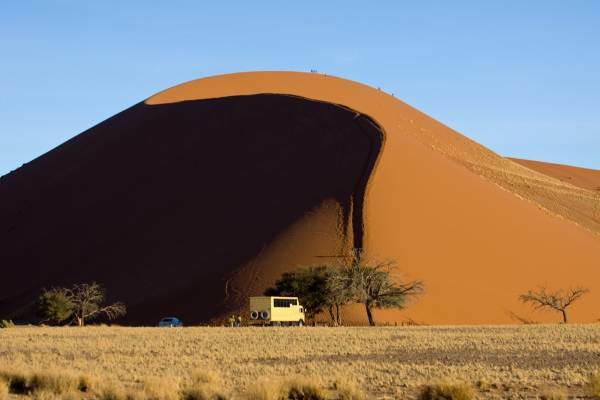 A comfortable overland tour focusing on the spectacular Namib Desert. Enjoy breath taking views of the Fish River Canyon and enjoy a sunrise over the sand dunes of the oldest desert. The tour begins under Table Mountain and finishes in the desert town of Swakopmund. Our accommodated overland tour begins in Cape Town and our first stop is to take photos of Table Mountain. Travelling north we pass through the Cederberg Mountains to our camp. We visit a working “Rooibos Tea” farm - a popular herbal beverage. The evening is spent getting acquainted with your fellow travelers. After breakfast we head for our next destination – the Orange River. The river was originally called the Gariep River (River of Hope) by the local indigenous people. The river is the longest in South Africa and forms a natural border between Namibia and South Africa. We set up camp on the banks of the river. The morning is at your leisure and one can choose to take a morning canoe trip or alternatively relax at camp, soak up the sun and swim in the river. After lunch we make our way to the Fish River Canyon. The Fish River canyon is the second largest in the world and has spectacular landscapes. A brief visit to the local hotspring before setting up camp. We enjoy a late afternoon walk along the edge of the canyon – have your cameras ready. An early start and we enjoy an early morning walk and sunrise along the edge of the canyon – have your cameras ready. We make our way west where we visit the unusual Quiver Tree forest and Giants Playground - named after giant boulder formation.. Early start to a long travelling day as we head for the Namib Desert. The day is spent commuting through ever changing terrain. Arriving at our camp, we head off on a short hike to explore the Sesriem Canyon. The evening is spent under the desert stars. The Namib Desert is the oldest desert in the world with the highest sand dunes and provides spectacular views. A very early start so we can enjoy sunrise over the desert. Those with energy can climb the famous Dune 45. The sunrise provides amazing contrasts of shadows across the dunes and is a photographers dream. We head further into the desert to Sossusvlei. There is time to explore the Dead Vlei – with its ancient trees and amazing sand dunes. We partake in a hike with a local expert to learn how the Bushmen survive in this harsh terrain. Before departing for Swakopmund,we enjoy an educational walk with a local expert. After breakfast we continue north to Swakopmund – the desert capital. En route we stop at the Tropic of Capricorn as well as Walvis Bay to see the flamingos. Swakopmund is where our tour ends. Recommended to spend an extra day enjoying the adventure capital of the desert and there are many optional activities to choose from. Note : Itineraries do change, please speak to your consultant for the latest up to date day by day itinerary for your travel period . Activity Package - R 550 ( Optional ) - This includes what we consider to be the key activities on this tour, A Breakdown of this payment is available from our consultants. Activity package & optional activities (see list on Itinerary for complete breakdown).